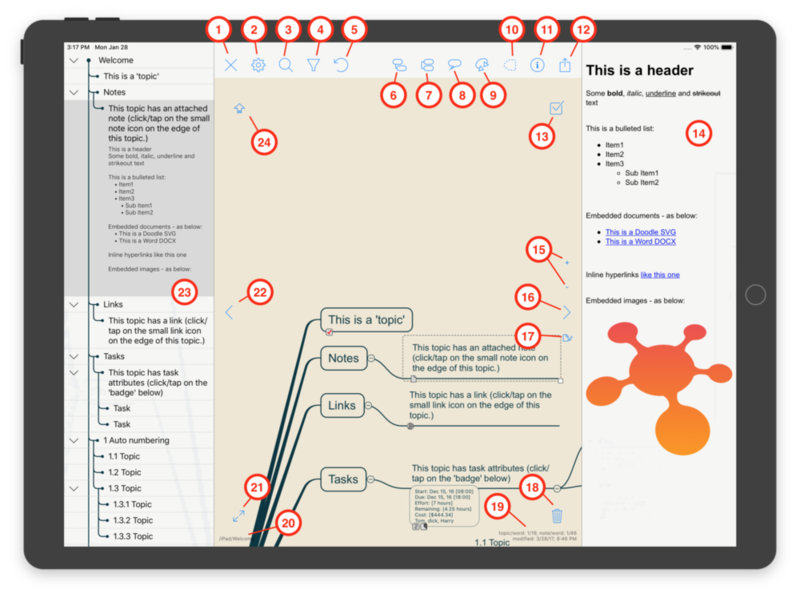 If you're totally new to mind mapping then it's worth having a quick look at http://en.wikipedia.org/wiki/Mind_map - but basically it's a great way to visually organise your thoughts and ideas in a broadly hierarchical format. Below is the Welcome map I ship with the Windows version of iThoughts. This gives you an idea of the type of diagram you can create. Topic = one of the 'bubbles' or 'nodes' on screen. A topic can contain text, images, icons etc. and can have a shape and colour. Parent topic = topic which has child topics. A parent topic can have multiple children but a child topic can only have a single parent. Child topic = see above. Sibling topic = a topic which shares the same parent as another topic. Branch = a topic and all its descendants. Relationship = line linking two, otherwise unrelated, topics. Links can be embedded 'inline' with the text. The maps created on all platforms look the same - what differs is how those maps are administered. Navigate to where you want to create the map (folder, cloud provider) then tap on the + ‘Create Document’ button. You will be asked to supply a name and the new map will be created and opened. Search button. Search for text within the current map (or across all maps.) Tap on one of the results to open that map. Create Child Topic button. TIP: Press and hold one of these buttons for more options. Create Sibling Topic button. TIP: Press and hold one of these buttons for more options. Create Callout. Tap on this to create a 'callout' topic. A callout is intended to be used like a sticky note to annotate a map. TIP: Press and hold this button to set the default colour for callouts. Relationship button. Create a link line between two related topics. Share button. Use this to export the map via email etc. Mark topic complete (100% progress.) Long press to apply immediately or drag/drop topic onto button. Notes area. Attach additional text, images and links to a topic. Double tap to edit. Increase/decrease the font size for topic notes. Show/Hide the topic notes window. Drag to change size of window. Toggle between View/Edit the topic notes. Trash can. Tip: Long press this to delete the selected topic or drag/drop a topic onto the trash to delete it. Full screen mode. Tip: Long press this to make it read-only. Show/Hide the outline window. Drag to change size of window. SHIFT button. Press and hold this whilst tapping on topics to multi-select. Press and hold this whilst dragging the canvas to create a 'selection marquee' to select multiple topics. TIP: Press and hold SHIFT whilst dragging a selected topic to duplicate it. Choose an icon. Tip: Drag/drop the icon or double click it. Choose a stock image. Tip: Drag/drop the image or double click it. Select from a predefined Style.